A Deep Pan Baked Pizza Base Topped with Tomato Sauce, Mozzarella Cheddar and Monterey Jack Cheeses. The Goodfella's cheese pizza you are holding right now is no ordinary pizza. This pizza, my friend, is our cheesily cheesy Pizza. 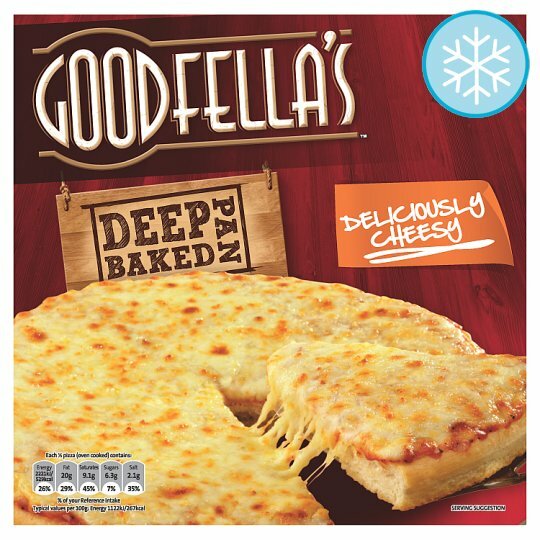 The finest and tastiest Cheddar and mozzarella cheeses, all on our classic light and fluffy deep pan base will tantalise your senses from the first bite to the last... Go on, give our delicious pizza a try next time you gather round a Goodfella's. Keep frozen, Food Freezer **** Until Best Before Date†, Star Marked Frozen Food Compartment *** Until Best Before Date†, Star Marked Frozen Food Compartment ** 1 Month, Star Marked Frozen Food Compartment * 1 Week, Ice Making Compartment 3 Days, †Should be -18°C or colder. Do not refreeze once thawed., See top of pack for Best Before End date. 2. Discard all packaging (recycle carton). Spread out all toppings... Yum! 3. Cook directly on top oven shelf (or on a baking tray) 22-24 mins. Bake until golden brown. Remember, all appliances vary, these instructions are guides only! Allow pizza to cool slightly before eating.. toppings can be extremely hot! Did you enjoy your pizza?